Ah Gary Seven! One of the few characters who could equal Spock’s coolness in the original series. Loved Teri Garr and Robert Lansing here (and the cat too!) I’m really sorry this teaser/pilot disguised as a Star Trek episode wasn’t made into a regular series; I think it would have been fun! I wonder if there is any Gary Seven fan fiction out there? I think Bryan Cranston would make an excellent Seven in a reboot! 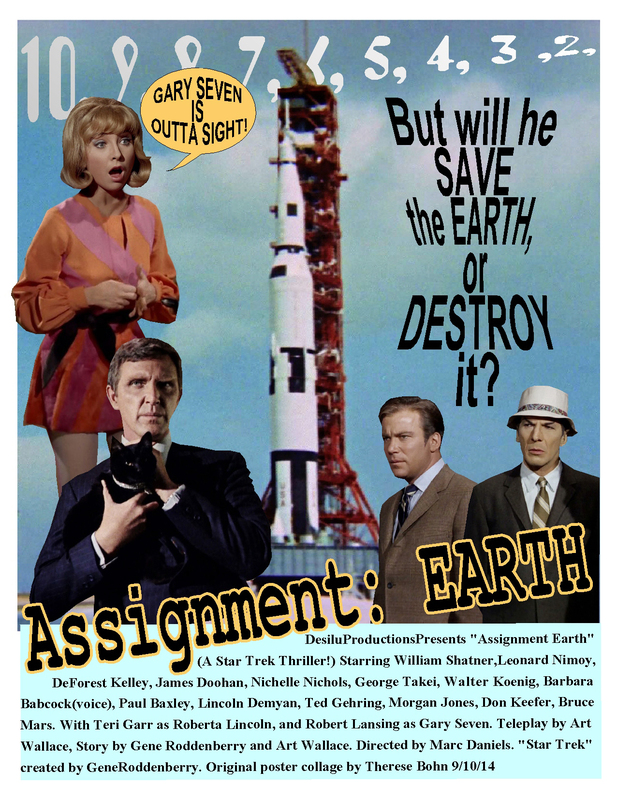 This entry was posted in My Star Trek Posters and tagged Assignment:Earth, Gary Seven, Isis the cat, Kirk, Pilot, Robert Lansing, Spock, Teri Garr. Bookmark the permalink. I have to say, I wasn’t comfortable with this episode, which was such an unabashed attempt to create a new series that Kirk and Spock ended up as also-rans in their own show, doing and saying nothing of any use. He was good, a bit James Coburn-ish! And I loved the story in TATV, when the black cat sneezed down Nimoy’s shirt! Same here. Kirk and Spock as extras in their own show felt SO wrong. I did enjoy how alien Spock looked in 20th Century Earth clothing, though. He doesn’t look especially alien to me most of the time — he’s just Spock, y’know? But in that suit, it was like, my god, he’s an ALIEN. I can get so comfortable with Spock that it’s nice to be reminded of his alienness occasionally, if that makes any sense. Oh, there’s a little bit. Call it hopeful self fullfilled prophesy.